I’ve talked previously about the inspirations for my vampire novel series, The Matriarch Vampires. The central West Virginia locations, Glenville State College, and the character nods. After shelving the original first drafts of the book two decades earlier, why did I feel it was time to dust them off and finally finish the story? One of those reasons was certainly Jonathan Weiss. My wife and I enjoy walking through old cemeteries and taking local ghost tours. There are many haunted places around the U.S., often in old cities like Birmingham, Alabama, Savannah, Georgia, and St. Augustine, Florida. Back in 2010, we traveled to New Orleans and took such a tour, and our guide to the city at night was none other than Jonathan. He looked the way I imagine a time traveler might, combining a classic appearance with a modern sensibility, a person whom has long since reconciled the old and new ways with a natural ease, elegance, and an eagerness to share his experience. Not having given much serious thought about fiction writing for twenty odd years, Mr. Weiss captured my attention and filled my imagination with stories and embellishments as we toured the French Quarter and Bourbon Street, recounting local legends with intriguing details and playing to the crowd… and yes, much was said about vampires. He and other occupants felt like a necessary part of the city, a piece of its soul that would be lost forever if abruptly cut out. Yet, as I understand it, that’s exactly what some are trying to do. Vampires aren’t born; they’re made. In my experience, they aren’t a race, a virus, or a curse. While I can’t speak to the exact intent of the bloodworkers who created the first Vampires, evidence suggests it was meant as a blessing… before things got out of control. That said, I wasn’t always as I am now. In either a somewhat late or ridiculously early Throwback Thursday #tbt, I found my old college blog — and by “found” I mean I’ve stopped trying to hide it. After what happened to myself and Daniel — what *I* did to Daniel — it hurt… it STILL hurts, but it’s part of who I am: my prequel. Also, a bunch of you keep auto-subscribing to it without realizing there’s nothing there, so now there is! It makes more sense in order, and there’s even a few old photos in there. Happy? Ever feel like you’re the star of your own television show? Not a good one or the most watched one, but a show on the bubble, always teetering on cancellation? You wake up, think about things, then go about your life. There are recurring supporting characters, the occasional guest star, and those who are written out because their contract’s up. If you were the outside observer — a mere viewer tuning in for a bit of escapism — how many stars would you give your own program? There’s a movie called The Truman Show about a man (Jim Carrey) whose life being broadcast live 24/7, only he’s blissfully unaware that his existence is scripted — entertainment for the masses. All of his successes and failures are orchestrated under the control of a director and a writer’s room. I don’t know about you, but I feel like that from time to time. So my question is, how about you? With online media and cameras everywhere, every word recorded and every image archived, doesn’t it feel nowadays like we’re all on television? On display for the entire world to judge or sympathize with? The only control feels like whatever you put into your profile, a sentence or two to sum up your full existence into an easily digestible bite for any potential audience. Bleeding-heart Millennial w/tragic backstory & fangs. Stargazer. Whedonite. Phlebotomist. Fictional character. Hugger. On half of my profiles, there wasn’t enough room to squeeze even one additional word in, so I changed them all to match the smallest allowed description (turns out that’s Google+ with 140 words or less) and I like the consistency. But I would be remiss if I didn’t confess a few folks I’ve spoken to don’t believe what I’ve been through in my short thirty years on this earth. I’m obviously disillusioned, a liar, and/or starving for attention… blah blah blah and yada yada yada. So for them and for me, there it is: fictional character — a made-up or imaginary person… because we all present the image of ourselves we want others to accept. Maybe I should have someone mock-up a few fake book covers and slap my face on them. Timothy? Memorial Day and a New Series Book Trailer! 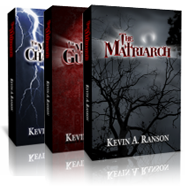 Kevin here, author of the The Matriarch Vampires. Janiss has taken Memorial Day weekend off, so I hope your weekend was enjoyable and that a few moments were spent remembering those who gave everything to defend their country. To provide a brief series update, the first draft of the fourth and final book is well under way, but I took a little time before a convention this past weekend to compile all the new images (and a few of my newest) to create an all-new novel series book trailer. I hope you enjoy it, and feel free to share it anywhere you can. Also, if you’re a fan of the series and haven’t had a chance to leave a review or rating for any or all of the books, please take a few minutes and leave as little as five words and a rating on Amazon. It really helps get the word out and anything is appreciated. And now, the new trailer! Janiss will return next Sunday with more Vampire Verisimilitude. I wanted to address a few rumors that have been making their rounds at Cedarcrest, not the least of which was suggested by your executive administrator a week ago. While Louisa Newcomb was still with us, a plan was created to govern how Cedarcrest Sanctum would develop and what the overall scope of the Cedarcrest Foundation of Appalachia would be. Part of it you know already; you live or work here, and we all know each other very well. Our facility has been a success and has remained true to our founder’s vision. That said and in light of recent events, we have begun developing implementation of Phase IV. I will be personally responsible for a key element in this phase, and this is not a decision I take lightly. Let it be known that these are options on the table and nothing is set in stone, but there exists the possibility I may no longer reside here at Cedarcrest as a result; a significant risk is involved. Ms. Connelly has much experience with regard to this and I greatly value her opinion, but ultimately the decision is mine to make. When the times comes and a final decision is made, you will not be left out of the loop. Have a great new year, everyone. No bait-and-switch angst today, just a fun idea. A throwback, if you like. We’re all-ages here at Cedarcrest, young and old, with many an All Hallow’s Eve tale to tell. For those celebrating, I’ve heard all kinds of stories about you little gremlins and your so-called harmless pranking. One of you titled yourselves “The Goblins of the Season.” Moving furniture off of porches, throwing rotten tomatoes or fruit, eggs and toilet paper. Little hellions all! Parents ignored this as long as it was kept to certain level; there were lines you knew not to cross. The best part sounded like keeping your secrets each year, with each other or from each other.